Law enforcement is a profession that attracts people with deep reserves of courage who are willing to take big risks for the people they serve, but the cops assigned to the NYPD’s Emergency Service Unit (ESU) take the notion of bravery to a different level. Nearly every incident they respond to is a high-risk, life-and-death scenario. They are regularly called upon to perform such tasks as dissuading a potential jumper perched on a high ledge, rescuing a child taken hostage, or freeing a family from the wreckage of a car accident. They will rush to help construction workers dying under scaffolding that collapsed or free severely injured office workers from an elevator that just plummeted forty floors. 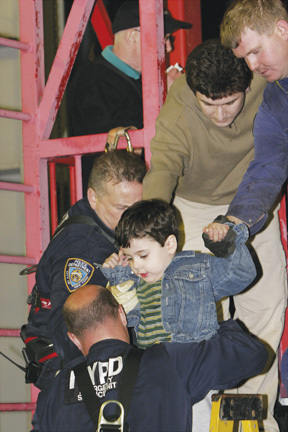 Officers bring a boy to safety after a tram was disabled over a NYC city street, dangling 250 feet above the East River. The youngster was trapped in the tram for almost 10 hours. It took the cops 12 hours to get everyone over to the rescue cage and back on the ground. The physical demands of such specialized work require these officers to be extremely agile and able to remain calm under tremendous pressure. Considering the fact that ESU officers respond to lots of calls that require them to get up on top of bridges and skyscrapers, good balance is critical. During his career, Mike Morra has dangled and rappelled off tall buildings and bridges scores of times. 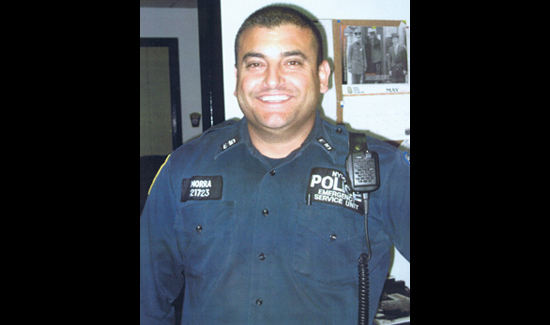 He remembers one man who was determined to end it all off an overpass in the Bronx. He almost succeeded, but Mike and his partner, Anthony Mazza, made it there in time. “We grabbed him just as he pushed himself off the ledge,” Mike said. “I had him by his belt and pants, and somehow we dragged him back up, which wasn’t easy. He weighed over three hundred pounds.” Since that incident in 2007, Mike has never missed a day of work, and no one has heard him complain, but his back still hurts and his doctor finally told him he may never be free of pain again. It’s not easy to get assigned to the Emergency Service Unit. One year there were four thousand applicants for fifteen positions. Officers must be on the job for at least five years and have many, if not all, of the skills previously mentioned just to be considered. There are twenty-two tests, including exams for mechanical aptitude and agility. Mike’s family, including his father, was in the building trades, and his father had worked as an electrician. Mike was a serious runner, and months before the test he began swimming five times a week. “I did everything I could to score high on every one of those tests,” he said. While a law enforcement career is often rewarding and exciting, there is a reason the job always makes the top five on any list of stressful occupations. The grueling pressure of shift work, working on holidays, seeing people at the worst moments of their lives, and coming face-to-face with heartbreaking cruelty and violence take its toll. And there’s the endless paperwork. Everything a law enforcement officer does has to be written up and filed, sometimes in many places. The complexities of getting a warrant, which some say is the most important skill in law enforcement, can be mind-boggling. A thorough understanding of the law is required, along with how the law has been interpreted and the ability to make the case in writing. Any officer who has worked hard on an investigation, meticulously gathering the evidence and building a case against someone they know is breaking the law, only to fail when it’s time to get the warrant, will tell you it’s one of the most frustrating and disheartening parts of the job. But even with all the violence and mayhem, Mike believed his most important weapons were his mouth and his brain. He’s still proud when he can control a situation with his wits rather than his firearm. And over time, cops learn to tune out abuse from the public. After a stop for speeding or a ticket for illegal parking, the outbursts of, “Don’t you have a terrorist to catch?” or “Isn’t there a bank robber you should be chasing?” or that old standby, “Don’t you know I pay your salary?,” rarely get a rise out of a cop who’s been on the job for a while. Yet there are times when even an easygoing and disciplined officer like Mike Morra gets annoyed. 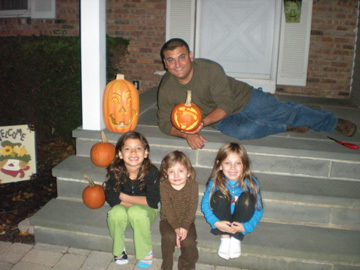 Mike Morra and his three daughters on Halloween night, 2008. Left to right: Marina, Lianna, and Michaela. All the girls are showing a keen interest in sports. Mike is still angry about the woman who came up to him when he was on patrol with a group of heavily armed officers outside Bloomingdale’s. It was ten months after the attacks of September 11. Excerpted from Brave Hearts: Extraordinary Stories of Price, Pain and Courage by Cynthia Brown, publisher of American Police Beat. Available at Barnes and Noble, Amazon, and at www.braveheartsbook.com. You are a gift from GOD.my son is one in BLUE and I keep all our men and women in BLUE in my prayers. GOD BLESS you , Sir.